This puzzle came from the urge to put FITBIT in a crossword (This was back in my early construction stages, when if I found an entry I liked, I built a theme around it, instead of, y'know, putting it in a themeless). After noticing the duplicated ITs and stumbling upon the IT COUPLES revealer, it was off to the races. The first effort was rejected because of unfamiliarity with themers LITE BRITE and… wait for it… FITBIT. After some theme re-brainstorming, I sent out the version you see here in July 2015, and it was accepted in October 2015. Not much to say about the construction process, except that it was a major pain to avoid IT anywhere else in the puzzle (Heck, while I was writing the cover letter, I noticed a stray IT in a corner and had to redo the thing). And, as usual, I love the edits Will and Joel made to the puzzle (especially the meta clue for 71A and the quote in 9D). Hope solving this puzzle wasn't a bITter activITy (hey, they can't all be winners). Apt revealer, IT COUPLE interpreted as "two-word entries, both words containing IT." I liked the fake-out of uncovering ITSY-BITSY and NITTY-GRITTY first ... and then hitting SWIMSUIT EDITION. I enjoy when a theme lulls me into thinking I know what's going on (a play on rhyming words) and then throws me off guard. A very nice grid, Paolo tossing in such nice bonus fill as GOLF CLAP, I MISS YOU, DOES GOOD, and even CATALYST. LOMBARDI and SNICKERS too! He's had a couple of great themelesses over at Buzzfeed — all clean and colorful — so it didn't surprise me to see that his grid is not just filled with goodies, but it's squeaky clean. It's exactly what I think a Monday grid ought to be. Great work there. The theme wasn't mind-blowing to me, as there are plenty of phrases with two ITs: CREDIT LIMIT, POSITIVE ATTITUDE, SWITCH HITTER, etc., but it works well enough for both novices and experienced solvers. And it's consistent, never resorting to a three-word phrase like A LITTLE BIT or something. One aspect that kept me from picking it as the POW — it's unusual to find a Monday grid as colorful and clean as this — is that I would have liked the themers to all be in the across direction. I love the great long entries Paolo added in, but they muddied up what was fill and what was theme. Putting all the themers horizontally might have made starring their clues unnecessary, as they would have all stood out better. 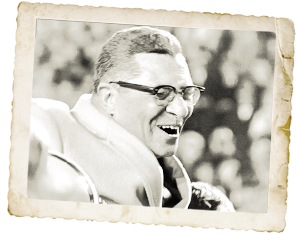 Great quote by Vince LOMBARDI: "The dictionary is the only place that success comes before work." Totally old-school, nose to the grindstone attitude that helped the Packers win the first two Super Bowls. It also applies to Paolo — it's clear to me how much work he's put into his crossword-making skills. Very well done.